Mill Creek Trail surprised us. With its tallest of redwoods, lush expanses of maple, moss encrusted woodlands and the simple but constant sound of the nearby creek’s riffles, this is a nearly perfect hike through redwoods. That it is only a couple of miles from the bnb — and the fact that Mill Creek can be combined with a visit to Stout Grove and Hioiuchi and Hatton trails — make it one of the very best nearby hikes. What makes it special: The number of truly tall redwoods that line this trail and are close by make walking Mill Creek Trail a heart stopping experience. 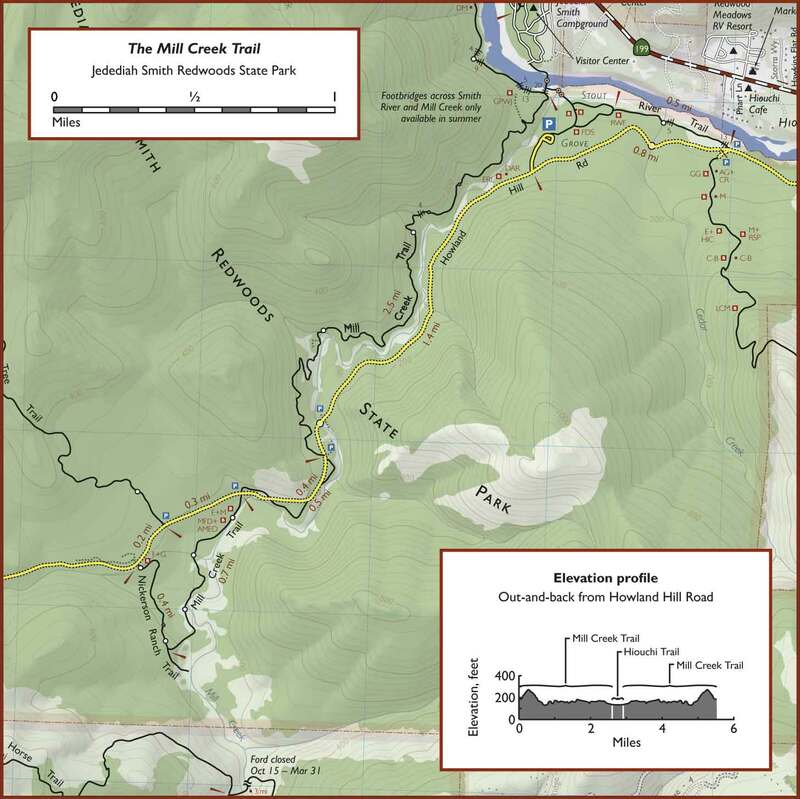 Except for a few busy weekends in the summer, including most of August when the Jed Smith Campground is full, there are fewer people on Mill Creek Trail than Stout’s loop trail. Fewer people, taller trees, and gurgling water make the MCT a qualitatively better experience for hikers and tree huggers. To add some mystery to the mix, Mill Creek Trail is the jumping off point for the infamous Grove of Titans, discovered in 1998 by Steve Sillett and Michael Taylor. Not that I can tell you exactly where it is though — the Grove of Titans’ exact location is a closely guarded and seldom shared secret. The grove includes the largest coastal redwood on earth, Lost Monarch, and other notorious titans (Del Norte Titan, El Viejo Del Norte, and the massive twin tree titan, the Screaming Titans). What to look for: A vast meadow of dwarf Japanese maples that carpet the forest floor near the beginning of the trail. A humongous fallen redwood you’ll need to climb over in order to continue, about a mile into the trail. And a small spur that drops down to Mill Creek…a perfect spot to relax, hydrate or snack on a granola bar. How to get to the trail/trailhead: There are three options to access MCT. First is to walk to the western end of the Hiouchi Trail until it hits Mill Creek. At that point the trail arcs to the right (generally south) ad runs parallel to the creek. This is also a good point to cross the creek and enter Stout Grove. A second option is to start your hike on the Stout Grove loop and take the spur on the loop that drops down to the creek, cross the creek and go left on the Mill Creek Trail. And a third option would be to cross over the Smith from the Jed Smith Campground on the other side of the longer foot bridge. If you come from the campground, step off the bridge and ascend the small hillock and then go left on the trail. Final take-away: Walking Mill Creek Trail gets you as close as you’ll ever get to truly magnificent and tall coastal redwoods. While the perspectives and vistas of redwoods seen from the Stout Grove loop and Boy Scout Trail have more grandeur and are arguably more impressive (more oooh’s and ahhh’s), the height of the trees on Mill Creek Trail are the tallest I’ve seen. Combine the abundance of tall trees with the peaceful sound from the moving waters of the creek itself and you have a perfect symphony of sight and sound. Drawbacks: Hikers on the trail may hear the occasional crunch of gravel from cars moving along Howland Hill Road, on the opposite bank of the creek. No biggie, but I can’t swear you won’t hear the subtle sounds of civilization. Change in elevation: 250 ft. Location, distance from bnb~hiouchi: The MCT is accessible in one of three ways: walk the Hiouchi trail toward Stout Grove and the same trail will morph into the MCT, cross the footbridge from Stout Grove to the MCT (summer only), or from a trailhead proximate to the bridge over Mill Creek on Howland Hill Road, 10 minutes. Snapshot description: This hike takes you into an area of giant trees (the Grove of Titans is said to be located in the vicinity of MCT). The trees here are enormous and many have fantastical shapes (arching, twisting, splitting into two- and three-trunked monsters). There are some delightful parts of the trail that follow enormous downed trunks and portions of the trail that hug the creek. The northernmost part of the trail (the end closest to Stout Grove) is set among a vast field of Maples, some which hug the ground and some that form a canopy that filters and dramatically alters the sunlight. Don’t miss the Mill Creek Trail.